There are still places available for courses taking place next month. Don't delay, book TODAY. You can see more information about the course here, as well as our Course Catalogue for 2019. Saturday 16th March saw this year's Young Bridge Challenge, EBED's annual youth bridge one-day event. Twenty teams competed in three rounds of Swiss Teams, after which the top four school teams were separated out to play Semi-Finals and Final for the Schools Cup. Loughborough Grammar School, the hosts of the event, won the Schools Cup, beating Haberdasher's Aske's School for Boys' B Team in the Semi-Final, and St Paul's School's B Team in the Final. The other semi-finalists were Exeter Maths School, an excellent achievement in their debut appearance in the competition. The remaining sixteen teams played two more rounds of Swiss Teams, won overall by Henry Rose, Jasmine Bakhshi, Liam Fegarty and Jamie Fegarty, who took home the Harry Scully Trophy. Only 1 Victory Point behind them was the Haberdasher's A Team, who won the Schools Plate for the highest-placed School Team at the end of the Swiss Teams. There was a record attendance of 34 players for the MiniBridge competition, which was won by a young pair from English Martyrs Catholic Voluntary Academy in Oakham (pictured, with EBED Youth Officer David Emerson). For more pictures, please see our facebook page. The results are available in full at www.ebu.co.uk/results/734. We wish to announce the retirement of Andrew Petrie from Chairman of the Board of English Bridge Education and Development CIO. 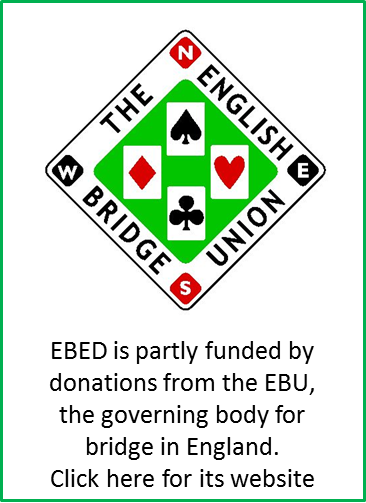 Andrew has held the position since shortly after the charity’s inception and his leaving marks the end of an era for EBED. We are indebted to his vision for propelling EBED to our present position, and his commitment and passion for bridge has assured our success for the future of the charity. We celebrated with Andrew by holding a small farewell reception at The Oak, Goldhawk Road, London. Those attending included Andrew’s wife Veronica, EBED Trustees and members of the team from Aylesbury. All of whom extended their good wishes to Andrew in his new endeavours. To mark the occasion, EBED CEO, Donna Wright presented Andrew with a gift from EBED colleagues and EBU staff. Andy Margetts has now formally taken over Chairmanship of EBED following the retirement of Andrew Petrie. Andrew Petrie has been involved with the charity since its inception and has been instrumental in getting it established as an independent organisation. Two other trustees are also now retiring: Gary Ames, who has played a leading role in shaping EBED’s education activities since it was founded and who, we are pleased to say, will continue to be involved as one of our Teacher Educators; and David Waxman who has been a trustee for the past three years and has chaired our Education Advisory Group and shaped our Governance Policy. We are enormously grateful to all three for their contributions to EBED. English Bridge Education & Development have this year launched a new annual teaching award, to celebrate a teacher who has made an outstanding contribution via the teaching of bridge. The award is specifically for the teaching of bridge to adults. Nominations are welcomed from any interested party, for more information or to request a nomination form emails should be sent to david@ebedcio.org.uk and should be received by 17th May 2019. It is intended to present this award at the EBED Teachers Conference, taking place from the 14th to the 16th of June at the Mercure Hotel, Milton Keynes (more information about the conference).